This entry was posted in Armonk, blog and tagged Armonk Luxury Homes for Sale on November 22, 2017 by Robert Paul. 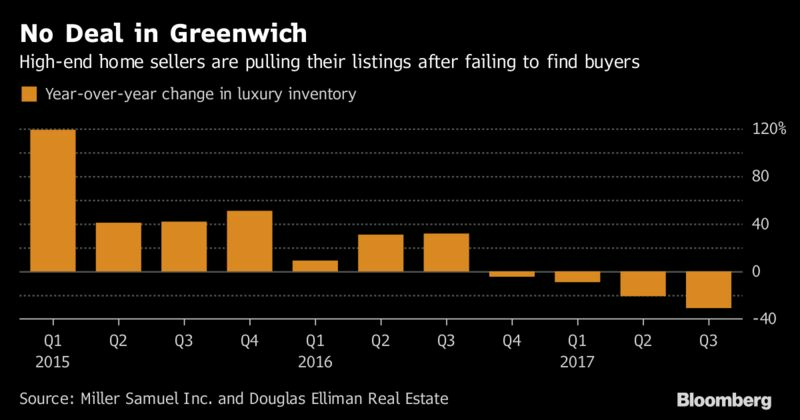 Listings of mansions in Greenwich have dropped for the past four quarters. But this time it wasn’t because sales were brisk. 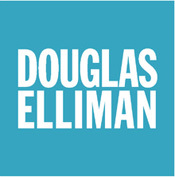 Luxury-home listings in the Connecticut town plunged 31 percent from a year earlier, according to a report Thursday by appraiser Miller Samuel Inc. and brokerage Douglas Elliman Real Estate. That’s largely because sellers who failed to get their hoped-for price quit trying to find buyers and took their properties off the market to wait for a better day. Tastes are changing in Greenwich, home to many Wall Street executives who take the 50-minute train ride to Manhattan. Lavish mansions on several acres have languished, while smaller homes closer to downtown get scooped up. In the third quarter, sales of luxury homes — the top 10 percent of deals by price — fell 13 percent from a year earlier to 21, the firms said. Condo purchases, meanwhile, jumped 35 percent to 58 transactions, the most for a quarter in data going back to 1999. The closer that homes are to Greenwich’s commercial district or waterfront, the faster they’re selling. At the current pace of deals, it would take 7.8 months to sell all the listed properties south of Post Road, an area that includes the train station and tony shops of Greenwich Avenue, Miller Samuel and Douglas Elliman said. In the Back Country section — north of the Merritt Parkway, featuring oversized estates set back from winding, two-lane roads — it would take more than three years to clear the listed inventory. One listing that struggled to find a buyer was 16 Old Mill Road, a 10,881-square-foot home that had three price reductions in its more than two years on the market, according to listing records. The property, on 5.3 acres that include a 2,329-square-foot guest house, was first listed in May 2015 for $17.35 million, and eventually whittled to $11.45 million before it was pulled in September. Brokers shifted tactics, relisting the home under a different address — 781 Lake Ave. — and with an additional discount, to $10.95 million. High-end sales had picked up earlier this year, largely because of price cuts, helping to clear some of the backlog. Sellers were still discounting this quarter, offering an average of 6.7 percent off the last listed price. The reductions drew in buyers for some costlier homes, pushing the median sale price in the luxury category up 34 percent to $6.5 million, Miller Samuel and Douglas Elliman said. That’s the upside to having so many fatigued sellers giving up, according to Durkin. It clears the distractions and boosts confidence for those who want to commit to a high-end purchase in town. This entry was posted in Armonk and tagged Armonk Luxury Homes for Sale on November 6, 2017 by Robert Paul. The Standard & Poor’s CoreLogic Case-Shiller national home price index rose 5.9 percent in July from a year earlier, slightly faster than June’s 5.8 percent annual pace. Sales of both new and existing homes slipped over the summer, which typically might slow price gains. But demand remains strong and has created bidding wars among potential buyers, pushing up prices at a much faster pace than incomes. The number of existing homes for sale fell 6.5 percent in the past year. This entry was posted in Armonk, blog and tagged Armonk Luxury Homes for Sale on October 3, 2017 by Robert Paul. Of the 100 seats in the Senate, Republicans make up 52 seats, Democrats make up 46 seats and Independents make up 2 seats (both caucus with the Democrats). And so far, the act has mainly garnered partisan support, passing through the Financial Services Committee in May in a completely partisan vote (34-26). House Financial Services Committee Chairman Jeb Hensarling, R-Texas, first introduced the act last year in an attempt to replace the Dodd-Frank Act. He released an updated version of the act this year on April 19. CHOICE stands for Creating Hope and Opportunity for Investors, Consumers and Entrepreneurs. “The Financial CHOICE Act offers economic opportunity for all and bank bailouts for none. The era of ‘too big to fail’ will end and we will replace Dodd-Frank’s growth-strangling regulations on community banks and credit unions with reforms that expand access to capital so small businesses can create jobs and consumers have more choices and options when it comes to credit,” Hensarling said. Some of the biggest changes in the bill affect the Consumer Financial Protection Bureau. The CFPB would be changed to the Consumer Financial Opportunity Agency, an executive agency with a sole director removable at will. The deputy director would also be appointed and removed by the president. This entry was posted in Armonk and tagged Armonk Luxury Homes, Armonk Luxury Homes for Sale, Armonk Real Estate for Sale on June 19, 2017 by Robert Paul. Activity levels and selling prices for the domestic real estate market last peaked in 2005, two years after the prior peak of the economic cycle (i.e., GDP) in 2003 (at 4.4%). Thus, by preceding the 2008-09 recession, this most recent national housing bust set a precedent as the first in recorded history in which housing helped lead the economy down. And when economic activity bottomed in early-’09 (March GDP fell 4.9%), domestic housing remained at stubbornly low levels for a few more years. Sources: US Dept. of Labor (BLS), National Association of Realtors (NAR), US Bureau of Census. 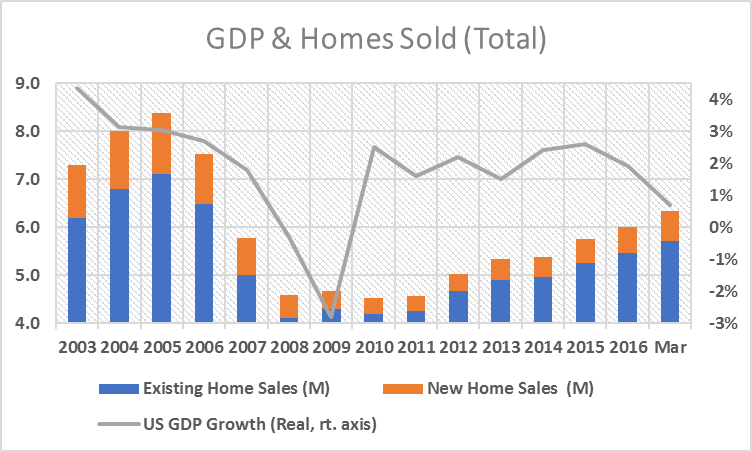 Note: sales of existing homes account for >90% of all homes sold in the US, up from ~85% pre-crisis. Even today, more than a decade after the start of housing’s precipitous decline, total US sales volumes (including new homes) remain nearly 30% below peak levels, and over 15% below the 2000-’05 average. It is a different world post-crisis / housing bust, and residential real estate’s demographic hurdles remain high. For example, baby boomers, many of whom live on fixed income payments, are only beginning to downsize or move into managed care facilities. 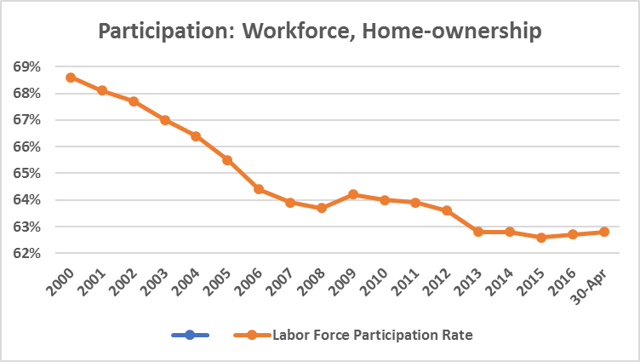 The more pervasive demographic challenge to home-ownership rates – now below 64%, vs. more than 69% in 2004 – is posed by ‘echo boomers’, in their 20’s and 30’s. Born in the 80’s and 90’s these younger demo’s that nevertheless still account for the bulk of entry-level home purchases, more often favor renting over buying, a contrast to their parents and grandparents. 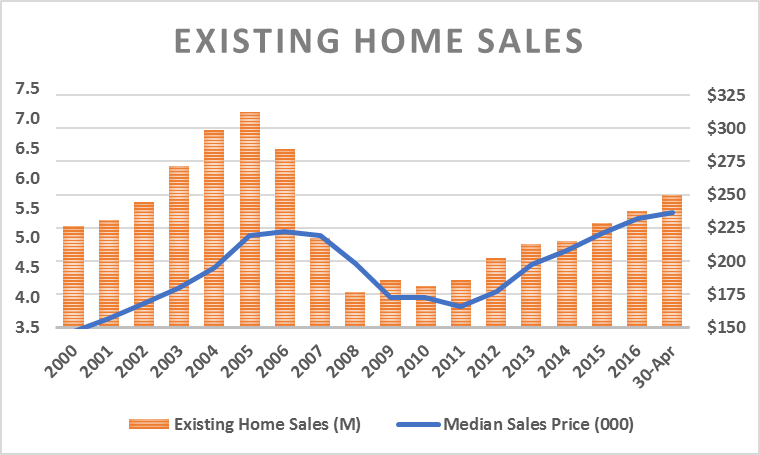 Thus, Entry-level home-buying now represents only about one-third of housing activity, down solidly from pre-crisis historical levels averaging 40%. First-time buying has, however, slowly improved from cycle lows in the high 20%’s, and in my opinion has plenty of runway ahead. A couple quick observations. The tight relationship between labor force participation and home-ownership, both of which appear to be bottoming or at least steadying. And, more importantly, the nearly six percentage point drop in home-ownership since 2004, and the comparable decline in entry level home purchases from most past averages. This paucity of first-time purchases, of relatively inexpensive homes, in fact overstates housing’s recent strength and helps underscore the housing industry’s lack of breadth. 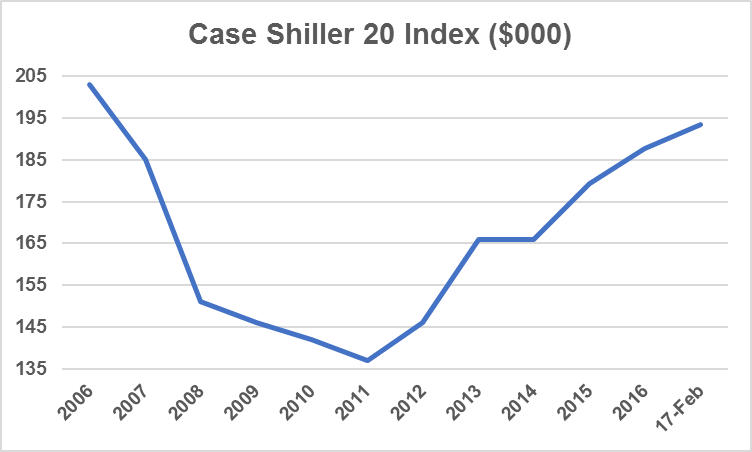 Case-Shiller, a commonly used barometer of domestic house prices (only), echoes later price charts, and indicates average selling prices (ASP’s) are still below levels more than 10 years ago. The most important driver for housing demand is job growth. Moreover, it’s the absolute number of jobs created, rather than the unemployment rate, that housing most depends. The 2017 YTD figure is annualized, and based on latest figures: April’s jobs and March’s home sales. Sources: US Dept. of Labor (BLS), NAR. 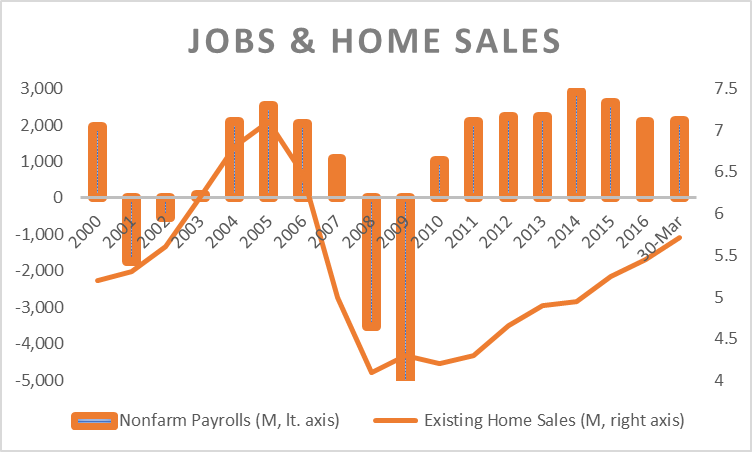 Indeed, existing home sales have tracked changes in jobs, but in direction – rather than in magnitude. Since housing peaked in late-2005, the US economy has added roughly 11 million new jobs, yet housing activity remains solidly below past levels, as we’ll talk more about. At some point new jobs will more accurately translate into similar increases in home sales. Consumer confidence is the next most important driver of home sales, after employment. Multiple cycles of empirical data bear this out. 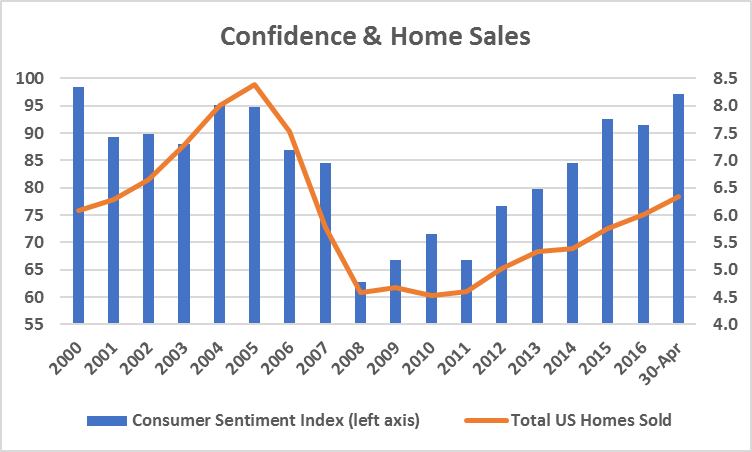 Despite steady improvements in consumer confidence since its 2008 trough, the figure, though still steadily upward trending, remains below it base level (100) just as home sales volumes track below their ‘normalized’ levels. To paraphrase Jamie Dimon, CEO of JP Morgan Chase, the country’s #2 mortgage originator (after Wells Fargo), consumer confidence is the ‘secret sauce’, to housing. Of course rates matter for housing: a single percentage point decline in mortgage rates buys a 15% more house (over 30 years, ceteris paribus). But, contrary to conventional beliefs, empirical evidence suggests interest rates rank behind consumer confidence in terms of importance for the industry. Although it’s the third leg of the proverbial stool supporting home sales, (mortgage) rates are the factor that most directly benefit from a Federal Reserve Board that has been decidedly ‘dovish’, pursuing relatively easy monetary policy these past 35 years or so. Yet as investors (and borrowers) handicap a potential increase in short-term rates by the central bank in its next (NYSEARCA:JUNE) meeting, we tend to overstate the impact of mortgage rates on housing. Favorable borrowing rates had a mitigating effect on the housing ‘bust’. The Fed’s move to zero short-term rates, which lasted a full seven-years (Dec. ’08 – Dec. ’15) has thus far had a similarly benign impact on the subsequent recovery. Their impact (low rates) has been partly muted by a number of factors, mainly mortgage originators’ basic business decisions (i.e., risk / reward), stricter home-lending regulations, the disappearance of independent mortgage brokers (e.g., Washington Mutual, Countrywide, etc.) and the reduced activity among government sponsored mortgage securitizers (e.g, Fannie Mae). Yet were it not for mortgage rates following 10-year Treasurys to just over 2% with the launch of quantitative easing (late-2008), financial history might have been much different: One can only speculate on the further damage to home prices, mortgages (especially adjustable), securitizations, etc. that would have occurred had the Federal Reserve not stepped in with zero rates and levered its balance sheet by $4 trillion. This entry was posted in Armonk and tagged Armonk Luxury Homes for Sale, Armonk Luxury Real Estate, Armonk NY Homes on May 9, 2017 by Robert Paul. A tax-reform proposal by House Republicans that would make the mortgage-interest deduction moot for most Americans is starting to set off alarm bells across the housing, lending and real estate industries. The right to take a deduction for interest paid on your mortgage has always been a political third rail, and the reforms introduced last June would not directly eliminate the write-off. Instead, the Better Way tax-reform “Blueprint” of Speaker Paul Ryan and his cohorts would make the deduction irrelevant for about 95 percent of homeowners. By “doubling the standard deduction that taxpayers receive…most people would have no need to take the mortgage interest deduction,” according to National Mortgage News. Before the election, when it did not look as though Republicans would control both houses of Congress and the White House, the future of the Blueprint seemed far from certain, and even given the GOP sweep in Washington, it is nowhere near a done deal. But National Mortgage News says the National Association of Homebuilders, the Mortgage Bankers Association and the National Association of Realtors (NAR) have all woken up to what they see as an “indirect threat” to the mortgage-interest deduction. National Mortgage News quoted Lawrence Yun, chief NAR economist, as a warning against any moves that might derail the housing recovery. “Even a discussion of mortgage interest deduction is counterproductive right now,” he said. A spokesperson for the NAR said Yun was unavailable to expand on that view given that under the Blueprint, most homeowners would still get the same break on their taxes. But homebuilders, lenders and realtors may have more to worry about than House Republican attempts to neuter the mortgage-interest deduction. This entry was posted in Armonk and tagged Armonk Luxury Homes for Sale, Armonk NY Homes, Armonk Real Estate for Sale on January 6, 2017 by Robert Paul.